Yes! It’s easy to do – you just need to select the correct saw blade for the job of cutting through metal. Having said that however, you will probably be better off with a corded power tool rather than a cordless one for obvious reasons – namely the amount of power available to cut through the metal. This will vary from tool to tool so it will be worth the cost of a saw blade to see how well you can cut with a cordless tool. Does One Type of Circular Saw Cut Metal? When asking the question, “Can a Circular Saw Cut Metal”, the type of metal you cut will influence the type of saw blade you buy, so let’s take a look at those next. 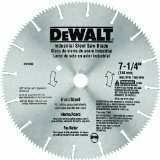 An example of an excellent cutting blade is the DeWalt DW3329 7¼ inch circular saw for non-ferrous metal cutting. I should mention that just because it’s a DeWalt blade doesn’t mean it will only fit DeWalt tools – that’s not true. This particular metal-cutting blade will fit any tool that accepts 7¼ inch blades and has a 5/8 inch arbor (size of the hole in the middle of the saw) or a diamond knockout. All ferrous metals require a different saw blade to cope with this much tougher material. So when posed with the question “Can a Circular Saw Cut Metal”, this is where a cordless tool is probably going to struggle and the answer ne ‘no’. In fact some blade manufacturers suggest that these blades are not meant for cordless tool use, so be warned. 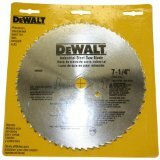 The above saw blade had limited user reviews, hence the 3.5 star rating. But I suspect some of the lower rating was due to unreasonable expectations of the blade. It is not masquerading as an expensive blade after all. If we look at a much beefier blade, you’ll get a different spec (as well as a bigger price tag). 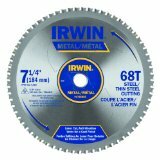 Changing from our DeWalt brand for the moment, there is the Irwin Industrial Tools 4935560 7¼ inch iron and steel cutting saw blade that gets rave reviews from users. I hope this page on ‘Can a Circular Saw Cut Metal‘ was useful to you.